For many years now my classes have been completing a course wide project on Picture Modelling. Before Desmos (B.D.) I use to send home copies of Geometer’s Sketchpad for students to generate a picture using only functions. 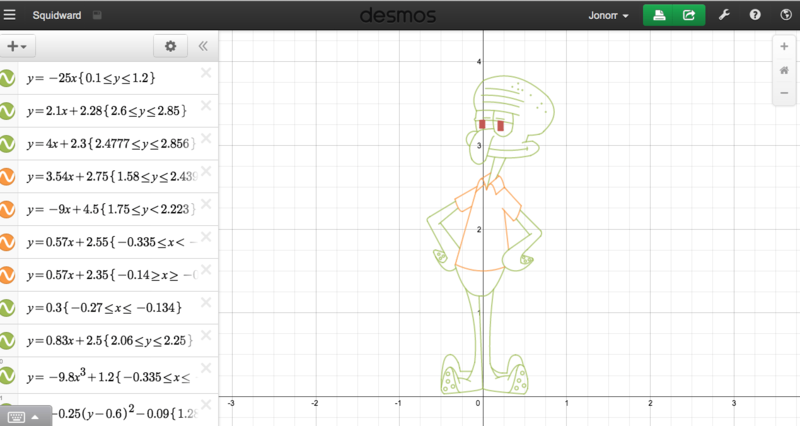 After Desmos showed up it was now super easy for students to generate art and access graphing software from any device. The project has been so successful at engaging students to learn about various functions and their transformations I extended it to all grades! For the last few years the project spans grades 9 through 12. Each year learning new functions and creating art. This summer while at the Apple Distinguished Educator Institute in Miami I started a project that would create a digital resource that would link the Modelling Functions with Art Project with function challenges created by Michael Fenton, Dylan Kane, and myself. If you are in an one-to-one iPad room or have access to iPads the resources are in an iTunesU course and multi-touch book for iPad otherwise they are linked on this site for any device (see below). Each chapter starts with linking patterns, tables, graphs and equations in pre-made Desmos graphs or in pre-made Desmos activities made using Activity Builder. 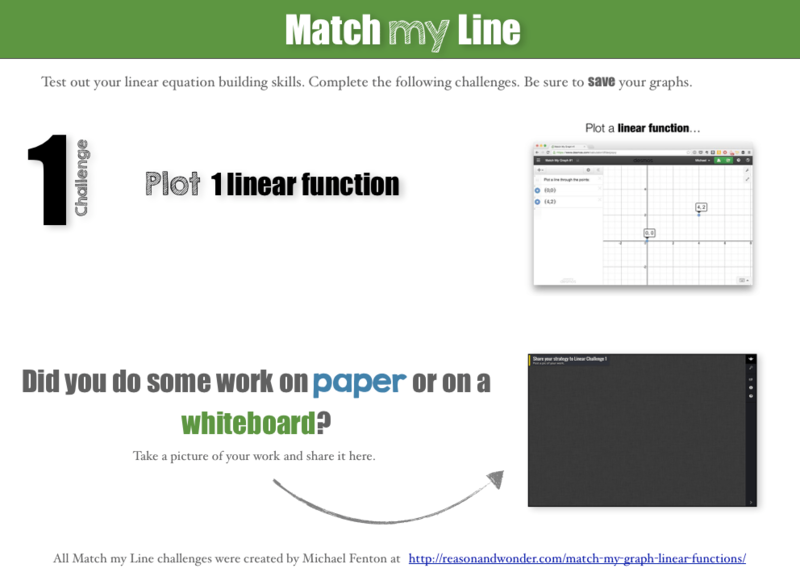 Following that, activities ask students to match functions to specific criteria like Michael Fenton’s Match My Line or in my Match My Trig Function. 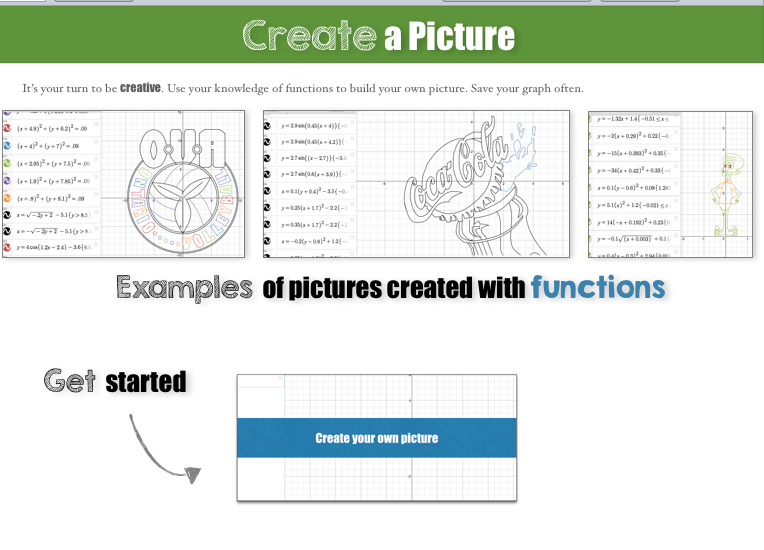 Again the teacher can choose to use the activities in the Multi-touch book or from the pre-made Desmos activity. Every so often in the challenges students are asked to show their thinking by uploading a picture of their work on a Padlet page. Students can crowd source different ways to solve the same problem. Finally, at the end of each chapter students are to create a working piece of art and share it on a Padlet gallery page! Students can see each others work and comment. Chapter 5 – Exponential & Logarithmic Functions – Grades 11 & 12 (Coming soon!). The project page has more details on how to access the course, book, and web resources.